The official Dungeons and Dragons series of paints and brushes. The brand new range of colours for the D&D universe has been thoroughly and painstakingly researched to match the many varied (and indeed colourful) creatures and monsters inhabiting it. The range is divided into 2 sets: the ADVENTURERS set (10 paints) and the MONSTERS set (36 paints). All paints are super high quality and bottled in new 12ml dropper bottles to avoid spill and drying out. Also, in each paint set there is a FREE Dungeons & Dragons miniature made by Gale Force 9 – and lastly, but not least – we have a cool D&D brush set too, to get you going. 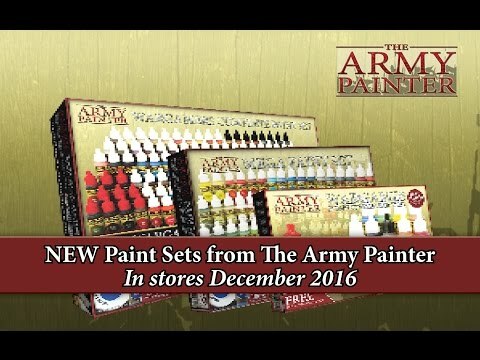 The Army Painter offers a range of Paint Sets - giving both beginners and veteran painters a choice of the ideal set. Cool Mini or Not have partnered up with The Army Painter to develop and produce custom paint sets for the popular Zombicide Boardgames by Guillotine Games. This exciting collaboration has so far spawned three paint sets for the mordern setting of Zombicide: The Zombie core paint set, a Toxic/Prison supplement and the Survivor supplement paint set. For the medieval fantasy Zombicide setting in Black Plague and Green Horde you will find two paint sets: The Zombicide Black Plague core paint set and the Green Horde supplement paint set. Here is your chance to get hold of essential zombie colours like Glistening Blood and Brainmatter Beige and enhance your gaming experience by playing with painted miniatures..
We offer a growing range of excellent Paint Sets with our trusted hobby partners. The Army Painter products are gaming-system neutral and can be used for any and all miniatures - from 15mm massed scale battles, through 28mm miniatures to towering mega robots or scenery - our range of paints are the perfect fit. No matter how great we think we are doing, The Army Painter cannot exist without all those superb miniatures that need painting – just like no miniature should go without paint. The Army Painter is your neutral supplier of paints and hobby accessories that will go along with any range of miniatures. WHITE CAP - there are 96 different acrylic Warpaints - aimed at making the complete selection of colours used to paint miniatures available in one place. With the amount of colours in the range, you would not normally be needing to blend paints to get a nice highlight effect - as we have now done that for you! Matt BlackMatt WhitePure RedDragon RedLava OrangeDaemonic YellowNecrotic FleshGoblin GreenArmy GreenGreenskinAngel GreenElectric BlueCrystal BlueUltramarine BlueDeep BlueAsh GreyUniform GreyWolf GreyMonster BrownDesert YellowFur BrownLeather Brown» More..
BLACK CAP - The Metallic Warpaints are of unsurpassed quality and with very fine flakes they will cover the first time they are applied. There are 8 Metallics available in the Warpaints range and as they are based on the same Medium they will blend together easily if needed. The famous and ground-breaking Quickshade is a pigmented varnish which will shade your miniatures perfectly and still let the colours come through. Painting armies of miniatures to fantastic results has never been easier - especially if you combine this high quality product with the revolutionary Colour Primers. This products sole purpose is for use with miniatures ONLY, and although it could possibly be used on a floor or a pair of shoes as well, we do not recommend it! The technique of dipping is not new. Shading your miniatures with a single dip is old, especially within the historical scene - but finally, a product which will shade your army perfectly and is fantastically easy to use - just have a look at every single Gallery on this site - you will not be disappointed! The Army Painter has some of the best quality superglue and Plastic Glue on the market. Packed in an Army Sized pot you will have a great quality product and save a lot of money in the long run. The glue has been chosen for it strong bond and its superb use with all miniatures and models and ALL our glues are manufactured in Europe to ensure a consistent quality. All our Starter Sets have been made with one purpose: to be excellent value for money. All the sets have their different uses and comprises of quality products packed in a way that you need look no further - everything you need is included and to a price where the individual products would cost a lot more than the compiled sets. Whether you are a beginner or a core hobbyist - the Starter Sets will be a natural choice. Special purpose brushes with sleek triangular handles for absolutely perfect grip. These brushes are top-end and each has the correct hair type for its purpose including Rotmarder Sable on the detail oriented models. All are handmade and manufactured in Europe. These brushes are made form the finest quality Toray synthetic hair and offers a great introduction to the painting hobby. An ingenious combination of Primer and Colour Spray in one. The Colour Primers unique formula has been designed to be used on all metal, plastic and resin miniatures and leaves a perfect finish. The extra-fine pigment and special nozzle combination makes the Colour Primers easily cover the first time. The colours are matt, making your freshly sprayed miniatures or models ready for basecoat almost right away. Save both time and money. No need for 2 different sprays - all you need is 1 Colour Primer for perfect results. Matt Black UndercoatMatt White UndercoatAnti Shine Matt VarnishAegis Suit Satin VarnishLeather BrownArmy GreenPure RedBarbarian FleshPlate Mail MetalUniform GreyDesert YellowSkeleton BoneNecrotic FleshGreenskinDaemonic YellowFur BrownCrystal BlueDragon RedAlien PurpleAngel GreenWolf GreyUltramarine Blue» More.. The Army Painters Hobby & Model tool range has been tried and tested in the gaming community for many years. Although with their new and reduced prices they are arguably the best value tools on the market today. The Army Painter offers a range of useful tools all designed to fit a special purpose, be it conversion or cutting models out of frames. Laser Line - TARGETLOCKPaint Mixing Empty Bottles (2019)Laser Pointer - MARKERLIGHTHobby Knife (2019)Tweezers Set (2019)Mixing Balls (2019)Self-healing Cutting Mat (2019)Precision Side Cutter (2019)Tape Measure - RANGEFINDERPlastic Frame Cutter (2019)Miniature and Model Drill (2019)Drill Bits (2019)Miniature & Model Magnets (2019)Miniature and Model Files (2019)Sculpting Tools (2019)Green Stuff (2019)Markerlight Laser Pointer (2019)Targetlock Laser Line (2019)Rangefinder Tape Measure (2019)Project Paint StationMiniature and Model DrillHobby Pliers» More.. The Battlefields series has been made to give unlimited options to the wargamer, when he/she decides on what type of bases the miniatures should have. All the materials are the best quality the market can offer the range has 2 series: the Essential series is the foundation of the base, with gravel, rocks, scatter and Static Grass. The Essentials are where you decide the theme of your army. The specialised Battlefields is called XP, and these will add very realsitic and cool effects to any base. If you want to make an army a cut above the rest - look through the XP series for just that! Basing: Brown Battleground (2019)Basing: Snow (2019)Basing: Grass Green (2019)Basing: Field Grass (2019)Basing: Steppe Grass (2019)Basing: Summer Undergrowth (2019)Basing: Battlefield Rocks (2019)Basing: Battlefield Razorwire (2019)Battlefields: Swamp Tuft (2019)Battlefields: Highland Tuft (2019)Battlefields: Winter Tuft (2019)Battlefields: Woodland Tuft (2019)Battlefields: Frozen Tuft (2019)Battlefields: Wasteland Tuft (2019)Battlefields: Mountain Tuft (2019)Battlefields: Jungle Tuft (2019)Battlefields: Scorched Tuft (2019)Battlefields: Deadland Tuft (2019)Battlefields: Meadow Flowers (2019)Battlefields: Lowland Shrubs (2019)Black Battleground - BasingSnow Flock» More..
With Runewars Miniatures Game you open the doors to the fantastic world of Terrinoth. On the fields of battle in the shadows of ancient ruins the Daqan soldiers - valiant defenders of the 12 baronies - do battle against the undead hordes of the Waiqar - awoken from their restless sleep by evil necromancers. Guided by the flowing forces of powerful rune magic you take the role of commanding general maneuvering your armies with strategic cunning in the strive for the final triumph. While you might very well want to play a few games using the unpainted snap-fit miniatures straight from the box, the ultimate gaming experience comes when two beautifully painted armies clash on the tabletop battlefield. On this website we will give you The Army Painter take on painting your Runewars Miniatures Game army. The Official 23pp comprehensive Waiqar Army Painting Guide. The Official 22pp comprehensive Daqan Army Painting Guide.